ABOVE: Installation of 6 panels with wooden frame. Congratulations on starting your vertical garden! It’s a simple process to get it growing: Plant it. Grow it flat. Mount it in its permanent home once roots have grown in. 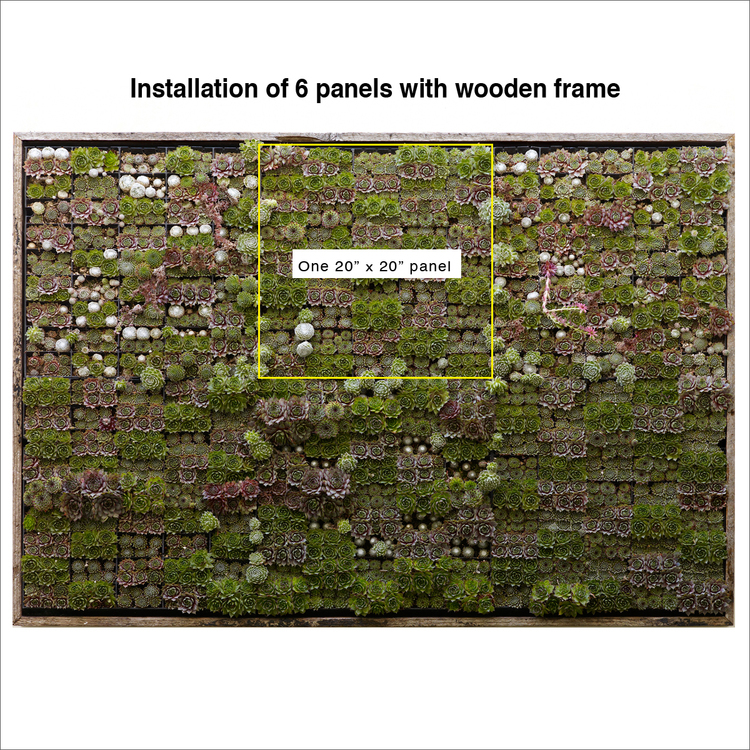 The 20"x20" tray contains 45 slanted planting cells to support plants and soil once mounted on the wall. and microclimate will determine which plants will thrive. weight of the planted panel. It also allows you to insert a drip irrigation line. a spot whose sun exposure is similar to where it will be permanently mounted. Allow for dirt and dirty water to drain off during the grow­ing period. Select your plants. Make sure they are suited to the exposure and your climate. inches wide by 2.25 inches deep. succulent gardens we use standard potting mix. climate, frequency of care, and imagination. planting medium, fully covering roots and rooting stems. Water your plants gently and thoroughly in the horizontal position. succulent panels, two to three months during the growing season (March through October) has been sufficient, but readiness will vary for each vertical garden. separate irrigation line for each horizontal row of panels. Watch it grow. Prune, weed and replant as needed.